At about 10 weeks, this is the basic shape of a little embryo forming into a fetus which will soon transform into a little bawling bundle of joy to be "delivered" on March 2, 2009. Oh, that's right, you heard me... we're bakin' a baby. The news is out! 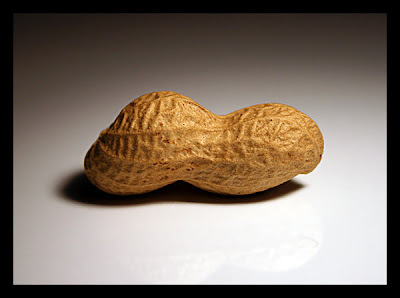 Shelli and I are expecting a little addition to our family this coming March, who we have affectionately named 'peanut' (due to he or she's striking resemblance) for the time being until we discover the gender and give he or she a proper name. We are so thrilled! This is such an incredible blessing, though a surprise, and we couldn't be happier. The amazing news really hit us when we got home from our anniversary festivities and Shelli wasn't feeling well. Since we knew there was a possibility that Shelli could get pregnant we thought we better make sure she wasn't just encase. Well, to our surprise, pregnancy test numero uno came up positive. We realized there was no possible way that could be accurate, so we tried again. Positive. Of course, something must be awry, right? We figured to try again in the morning. The next morning came and test numero tres... positive?!?! How can that be? So we went and saw the doctor. they needed blood test to confirm, of course, and we knew they would reveal the inaccurate performance of the pregnancy test we had first turned to. Ummm... not so much. Not only were we expecting a baby, but we found out a week later at our ultrasound that we were 10 weeks along! Umm... how... really... but... wow. 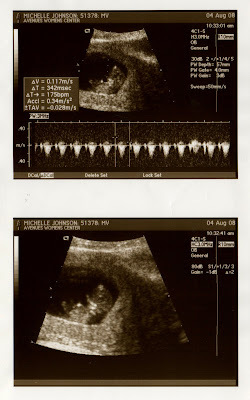 that ultrasound was one of the most incredible moments of my life. Though we didn't necessarily expect to be pregnant at this point, I couldn't be more happy and excited about it, and I know Shelli feels the same too. At the ultrasound we expected to see the little fella still in 'blob' stage, but that was not the case, you could totally see the little baby! Arms... legs... head... it was amazing! I could not believe that we were about to be parents and this amazing feeling of joy and anticipation came over me. I couldn't help but beam with excitement. Ever since that moment it has just been sinking in more and more. This past Monday we went to our first visit with the midwife and she has been very helpful. Everything was A-Okay and we even had the chance to hear the babies heartbeat! Again, I was breath taken and amazed. I cannot believe how amazing it is to hear my baby's heartbeat like that. I don't think I have ever felt more overwhelmed in all my life. I love my wife more than life itself and I look forward to starting a family together and sharing our love with our children. I don't think I have ever been as ill-prepared and excited about something at the same time. "Woohoo, I'm gonna be a good daddy!" I love you Shelli and "Peanut"